You may have noticed I've been talking about sunflowers a lot. Well, it's sunflower season and I really love sunflowers! Since they only bloom for a few short weeks time is of the essence my friends. I wrote about the Elverson Sunflower field in the August 2018 issue of Lancaster County Magazine, so I've been focused on sharing more about that destination. I've been driving down there and taking pictures of the sunflowers in their various stages. Now, the field is getting towards the end of its bloom, so this weekend will be a prime time to visit. Thanks to all the rain It's a bit mushy out there, and the flowers are a little soggier, but it's still a very lovely scene to photograph. It's really cool to see so many people enjoying it. I've been keeping an eye on all the rain we've been having recently. I've been impatiently waiting for the rain, and the light, to come together so I could capture a rainbow at the sunflower field. When it first started to bloom I saw all the rain in the forecast and hoped it would all come together. I spent a few rainy hours in the parking lot with no luck. Last evening I was on high alert. I was headed toward the sunflower field but had stopped at Grocery Outlet in New Holland quickly. Coming out of the store I looked up to spot a dim rainbow stretched across the sky. Now I was certain "tonight's the night". A quick look at the radar indicated that we should be on pace with the storm. 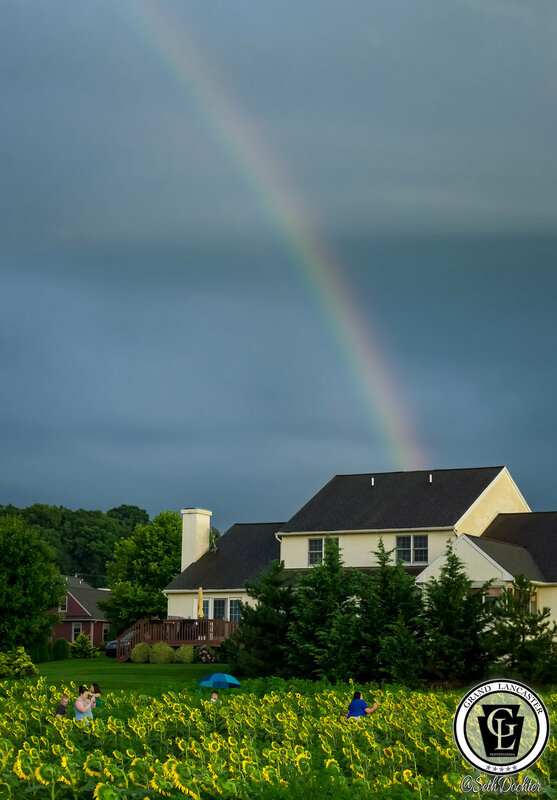 I told the kids the rainbow hunt was on, and off we went. We spent a few soggy minutes in the parking lot, but as soon as I spotted some openings in the clouds we headed over to the field. The rain drops continued to fall on us while we waited for the clouds to open up. That's good though, it's all part of the recipe for rainbows. Within a few more minutes the clouds opened up and a full arching rainbow stretched across the sky. So where's it at you say? Well I can't spill all the beans at once. After you get done below checking out the video and pics from last evening, scroll on down to the "Magical Sunflowers" banner to check out my story on the Sunflower field and where to find it. This will be a great weekend to get out there before they start their decline, hope to see you there! Interested in Photography? For these shots and the video, I used my Sony a6000 and GoPro Hero 5. These are my go-to cameras, and since there are updates models of each you can get a lot of quality for a little bit less money. These cameras work well from beginner to Professional. Check them out below, and when you buy through Amazon we'll earn a little comission for the refral. Discover this gorgeous Sunflower field in nearby Elverson, Pa in the August 2018 issue of Lancaster County Magazine.